Bruce was head basketball coach at the University of Arizona from 1961-72 and before that was an assistant coach under Fred Enke at Arizona for two seasons. Prior to coming to Tucson, Bruce was basketball coach at Eastern Arizona College (1951-57) and took his team to the Junior College national tournament four times, finishing second in 1957. At EAC, he also was head baseball coach, assistant football coach and athletic director. After EAC, Bruce went to Weber State College in Utah and coached the basketball team to a runner-up finish in the 1958 Junior College tournament and a national championship in 1959, earning National Coach of the Year honors. Bruce also coached the Sonoran basketball team, finishing tied for first in 1977 and fifth in Mexico’s national tournament. His overall record as basketball coach was 310-225. 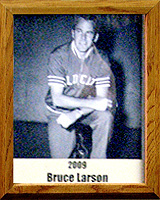 After retiring as basketball coach, Bruce worked as a television analyst for University of Arizona basketball and football games. He was inducted into the UA Athletic Hall of Fame in 1972 and the Junior College Hall of Fame in 1989.